The 4KPPP Micro Oil Skimmer is a lightweight chemical resistant oil skimming unit designed to skim oil and sludge and other floating contaminants from any body of liquid, i.e tanks, ponds, streams and restricted areas. It is constructed using chemically resistant Polypropylene and will withstand high water temperatures, a wide variety of solvents including hydrocarbon-based materials as well as salt, caustic solutions and a variety of strong acids. 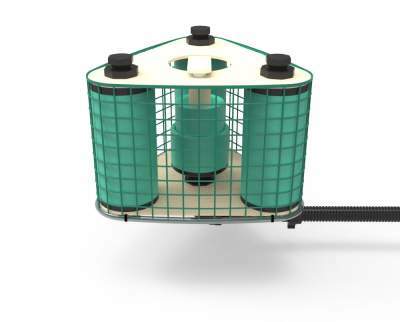 The 4KPPP floating oil skimmer measures 350mm x 350mm x 445 and will fit through a 350mm opening. 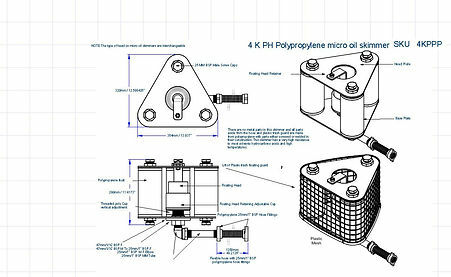 The draught of the 4KPP Micro Oil Skimmer is 265mm - that is from the water level to lowest part of bottom fitting. 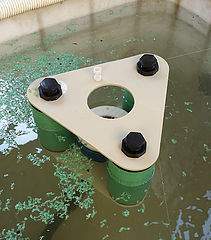 The polypropylene floats on the oil skimmer are sealed with a 1” BSP cap. 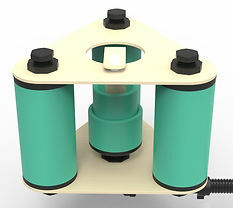 Water is used as ballast to hold the skimmer at the required depth.The ballast inside the floats stabilizes the oil skimmer and the floats are sealed using a plastic welder. Pipes and other ancillary fittings used are constructed using Polypropylene. It comes complete with a self-adjusting floating head that is made using a polypropylene outer retaining cup with an inner floating head. Water is drawn down through the inner cup which automatically adjusts its position relative to the water’s surface to allow the required amount of surface water drawn by the pump to pass over it.The depth to which the weir (top of the inner cup) goes below the surface of the water is known as the “cut”, the less the amount being pumped the finer the cut. Net weight 4.5kg, Gross weight 5.2kg. Unaffected by heat to 100c. Polypropylene heat and acid proof fittings. Floats, unaffected by changing water levels. Low maintenance - no mechanical moving parts. Can be supplied with connection to suit client needs. Will work on gravity alone - without a pump.